July 18th……Come Early, Stay Late!! 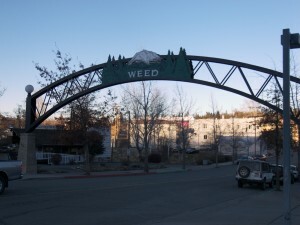 cruise on down Weed’s Main St. under the arch…. around the corner….stay on the main drag…… and look on the right , you’ll see our favorite hole in the wall….Papa’s Place, it’s a full bar, you can park right on the street, or around the corner. Saturday the 18th after the Carnival closes down around 9pm ET and the Night Shift, a rockin’ Blues Band will be playing into the night!! So put on your dancin’ boots and grab a partner, cuz you can’t sit still with music this good!! If your’e still hungry PaPa’s Place is also serving food… Homemade Chilli, Homemade Italian Sausage Sandwich, Hot dogs, chilli dogs, hot wings, Tequilla Lime wings, Lousianna Hot Links….chips….. I recommend staying somewhere in town, most of us can’t drive away from Papa’s during Carnevale weekend, be safe, and responsible, get a room, or a taxi!! !